Who doesn’t love brunch? But mix brunch and a wedding and you have a great day. Firstly, its a great way to host a lower cost wedding reception; its during the day and usually held on a Sunday…watch those dollars saved add up. Second its an early enough end so you can host it on a Sunday and guests can still go to work the bet day…I mean how great of an idea is this! 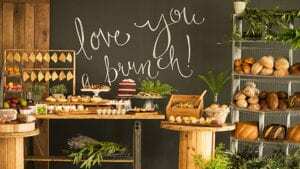 Here are our top tips for planning an amazing brunch for your wedding! Be ready to start your day early…like really early – How long will your hair & make-up take for you and your bridal party? You will need to get up early to make sure you are camera ready for the ceremony start. And if you plan on taking photos before hand, its an even earlier start. This is a big factor for some couples. Your reception will be shorter than an average wedding reception – Brunches usually last about 2 hours as apposed to a 5 hour reception. So nixing out the important dances or traditions may happen, if you are fine with that then brunch is for you! Its a casual affair – Guests will typically wear cocktail attire, so if you are looking for a fancier reception a brunch reception may not be for you. Also the wedding parties attire will be more casual as well. The food will be less fancy – Brunch bites are a combo of breakfast and lunch foods and super casual. No one is looking for a 6 course meal at 1pm. You won’t have a full open bar – Brunch receptions are usually resided to mimosas, bloody marys, champagne, beer & wine, or sometimes not even include alcohol. And this is a big money saver if you are watching the budget. It definitely will not be a dance party – While you can still have a DJ or band, the dance floor will not be packed with dancing and fun. Its a much more casual atmosphere for you and your guests, but still super fun! If a brunch wedding sounds good to you, lets chat…we love making brunch receptions happen! And if not, use our tips to create your own amazing one!